Contemporary Villa at a very affordable price! 3 bedroom, 3 bathroom villa with private swimming pool, all the conveniences of home! Complimentary airport transfer! Located in Jamaica's magnificent Ironshore Resort Estate at Montego Bay, Island Breeze Villa has a beautiful panoramic view of the Caribbean. 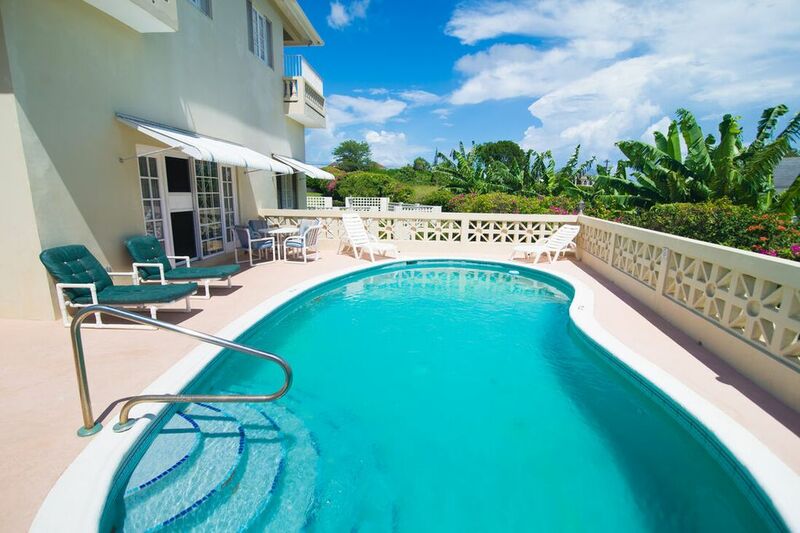 Located 15 minutes from the center of activity in Montego Bay, Island Breeze Villa has a beautiful panoramic view of the Caribbean. Located in magnificent Ironshore Estates, this 3-bedroom/3.5-bath villa is only minutes from numerous championship golf courses, as well as tennis courts, shopping, horseback riding, and the Hip Strip where a new casino is located. Included in your rental fee is one round trip complimentary pick-up upon your arrival at the airport, with a 7 night minimum. We will meet you and take you to Island Breeze Villa, where you'll be welcomed with a punch or rum punch drink. Your cook will prepare your requested evening meal on the day of your arrival; you need only indicate your menu preference. Vacation Rental Amenities: Available for your use are a stereo CD/Cassette/Radio player complete with CD's and cassettes. Or you may choose to bring your own choice of music. Cable TV is provided and there is a 25" color TV in the TV room with a VCR and DVD player. Also available for your use are some books, games & puzzles. The main floor consists of a sunken "L" shaped living/TV room overlooked by an 8-ft. bar for serving those rum punches, pina coladas and other umbrella drinks. Through the French doors in the Living room you can enjoy the view of the Caribbean or...walk out onto the pool deck and enjoy a quick refreshing swim in the beautiful fiberglass finish pool. The main living quarters of Island Breeze Villa contains 3 private bedrooms each with cable TV, private bath, a ceiling fan, air conditioner. Two of the bedrooms have a balcony overlooking the Caribbean. There are 2 queen beds and 2 twin beds. These twin beds can be pushed together to make a king bed. There is a full size kitchen and the dining room is only steps away. Also, there is a laundry room if you choose to take fewer clothes and have room to take back all those souvenirs. Your housekeeper will be happy to do any laundry for you. Visit Dr. Cave Beach for a white sandy beach, crystal clear blue Caribbean Seas nearby in Montego Bay - Our favorite beach! One complimentary roundtrip airport transfer included with a 7 night stay or longer. 4th bedroom can be a converted study - for kids - fan cooled. First time to Jamaica and this villa was fantastic. Got pampered and was everything I expected and more. Hi Renata, we really enjoyed having you in Jamaica! Yes it's summer in Jamaica and only the bedrooms are air conditioned in this and any villa. As you know, Jamaica is a island and all things are imported on island and electricity is about 10 times more than in the USA, so owners do not air condition the living room areas. But thankfully, the villa has air conditioned bedrooms, and also a wonderful swimming pool! Thank you for making it Jamaica!